« Let JibJab be Your Valentine! Come see the work of one of JibJab’s most insanely talented artists! 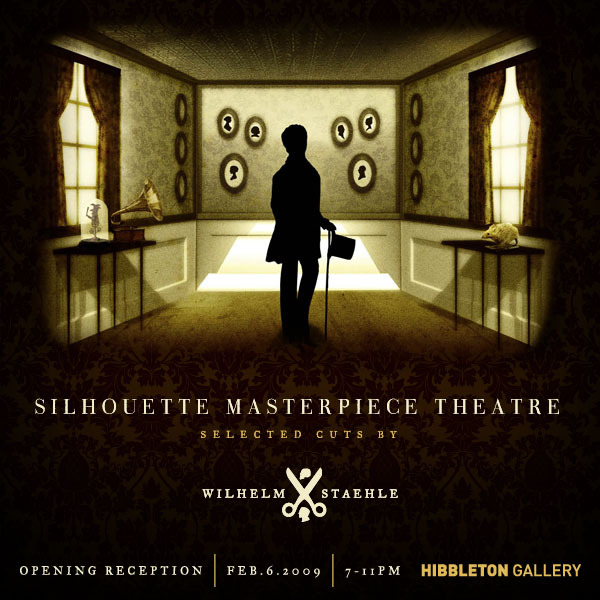 Wilhelm Staehle is putting up an exhibit at the Hibbleton Gallery all through February, featuring his twisted, hand cut silhouette pieces. Staehle is influenced by the look and feel of Victorian design, and explores the marriage of Victorian elegance with macabre humor. He is inspired by old fairytales and poems whose meanings and origins are far less innocent than they appear at first glance. He is also attracted to silhouettes, which are common in Victorian art. However, traditionally, silhouettes are black, to imply shadows. Staehle often reverses these silhouettes, making them light instead of dark, thus making them “blank slates” where one can imprint their own meanings onto the forms. In this way, the mere shape of a person gesturing does not always reveal the truth of what is happening. This entry was written by paulhanges and posted on February 5, 2009 at 1:11 pm and filed under General, Uncategorized. Bookmark the permalink. Follow any comments here with the RSS feed for this post. Post a comment or leave a trackback: Trackback URL. Will you be coming up with more sports ,like golfers,baseball,etc that heads can be put on vidio’s ?? do you plan on coming up with more sport figuers. Golfers ,basball, football etc. ?